Calling all you Jimi Hendrix fans. 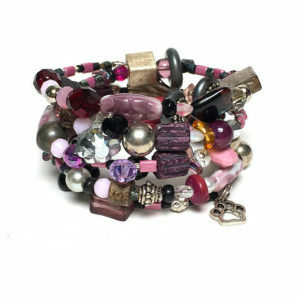 This bracelet is called “Purple Haze.” You know who you are or you know someone who is. Someone who likes to mix it up, go wild without symmetry. Excuse me, while I kiss the sky. For May, Beading Divas bracelet sales benefit Hard Luck Hounds, AZ. They help lonely dogs find loving forever and foster homes. As a non-breed specific dog rescue group, their goal is to help dogs in need, whether stray or abandoned, owner-released or shelter dogs. Foster-based only, their ability to help dogs depends on how many volunteer foster homes are available. All bracelets are handcrafted, one-of-a-kind and made with donated beads. Bracelets cost $20, no tax. Hard Luck Hounds receives $20 for every bracelet they sell person to person and $18 for every bracelet sold online. Postage is based on destination. Bracelets are mailed worldwide. Please note: Bracelets online via Etsy have already been photographed, uploaded, wrapped and labeled. What’s on Etsy stays on Etsy until someone buys it off Etsy. You cannot pick up an Etsy bracelet anywhere because the fulfillment is done by volunteers in private homes. If you like it, buy it – one of a kind — when it sells, it’s gone.